For the trips’ first Christmas, we made a pre-Christmas visit to Nana and Grumples’ in Long Island, where we saw Baba (great-grandma), Bumbie (great-aunt), Courtney (first cousin once removed), and a few other friends. Will had to work in the city, so we made plans to FaceTime Monday night. FaceTiming with three nearly nine-month- (six-month?) olds is a bit of a logistical challenge. It sure is entertaining, though! Sophie clearly missed her dad. At Nana and Grumples’ the trips also tried out their booster seats. Who said feeding three babies at once was hard? 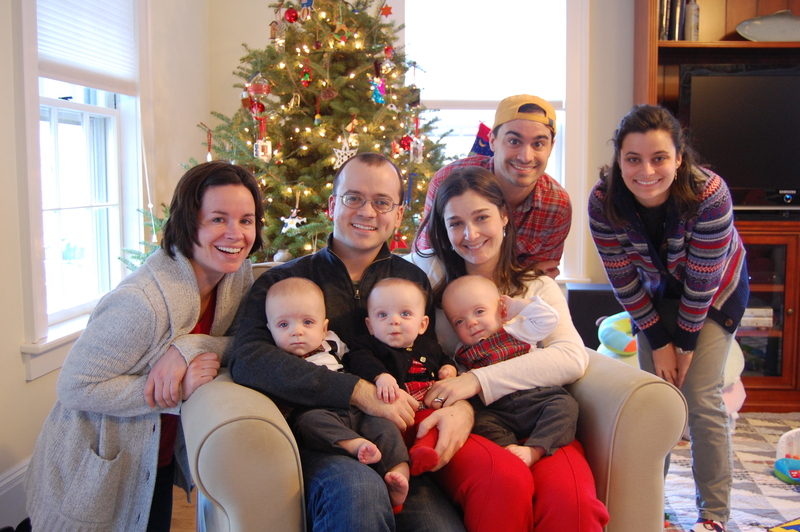 On Christmas Eve Day, we said goodbye to Nana and Grumples (who were gearing up to go meet their newest grandchild, arriving any moment now in D.C.!) and piled back in the van. It was off to Connecticut to see Grammie and Nonno. The trips are in the midst of their “stranger anxiety” phase, which made these two trips to see the grandparents a little bit difficult at first. Nothing like your grandchild wailing in your face to say, “I missed you! Thanks for having us!” But in both instances, Henry, Jack, and Sophie quickly adapted and remembered, “Oh, right. I DO know you! And I love you!” Soon enough they were rolling about on the floor in Norfolk too. This Christmas was a bit different than Christmases past. For one, we were all operating around the babies’ schedule. That meant everyone had to be up and ready for stockings before 8am, breakfast had to be made and eaten during their morning nap, and we needed to finish up under the tree in time for their 1pm nap. All went off without a hitch! How grateful we are to have such obliging aunts, uncles, and grandparents! Parents of multiples will be particularly impressed that we managed to stay on schedule despite the joyous chaos of Christmas celebrations. Our nanny will surely appreciate this as well! Sophie quickly made a run for the presents. Pretty sure we could fit INSIDE these stockings. Opening our stockings on Christmas morning. Playing with our new loot. Learning how to play her new piano. 5pm on Christmas Day. Enough said. It’s not nearly as much fun without the hats. Oh wait. Yes it is! Then, all dressed up in our holiday best! And with the help of Aunt Lizzie, Grammie, and Nonno, a (nearly) full group shot with a self-timer. I think we are all looking at the camera. Success! For better or for worse, Christmas is a season of giving, and Henry, Jack, and Sophie are lucky to have many thoughtful and generous friends and family. To be honest, Henry, Jack, and Sophie (and by proxy, their grateful parents) have been blessed with an outpouring of gifts since the news of their impending arrival went public a year ago. Countless meals delivered to our doorstep; free rides to and from the hospital for the two plus months the babies spent there; piles of clothes, diapers, and bibs; high chairs, cribs, strollers, swings, and a number of other baby depositories and paraphernalia; free babysitting while Will and I went off to a movie, Christmas shopping, an Anniversary dinner; the list goes on and on. I am not sure I can ever thank all of those people enough, but I do hope that this blog and periodic visits with Henry, Jack, and Sophie, bring a bit of joy to the lives of those generous souls if ever my thank yous have fallen short. This Christmas, it was all about TOYS. It seems appropriate, both given the spirit of the holiday and the fact that on the cusp of their nine month birthday, these babies are really starting to PLAY. It will never cease to amaze me when they “find something” or “figure out” how something works. At this age (6 months adjusted), cause-and-effect toys are the most developmentally appropriate–anything that lights up, pops up, or makes noise when you touch it is bound to be a hit. Anything they can put in their mouths was also at the top of their list, along with books. Those they can “read” themselves, and those that will be read to them! Here’s a snapshot of all the fun they’ve been having. Of course, the wrapping was just as exciting as what was inside, so we spent much of Christmas day pulling paper out of the the trips’ mouths. Nevertheless, these toys will last a long time, and the way they were attacking that wrapping paper, its days were surely numbered! Sophie practicing sitting while gnawing on her massaging teether. Jack reading a little bit about puppies. Thanks, Phoebe! This Lily Pulitzer bag was especially enticing. Henry, Jack, and Sophie received so many wonderful gifts, it would take too long to write about them all here, and I am certain you would grow bored (if you are not already)! But I will take a moment to venture off on a brief tangent about famous triplets. Bear with me. I will circle back to Christmas, I promise. In addition to their own celebrity status here at henryjackandsophie.com, the Strumolo triplets are not the only famous triplets around. There’s Huey, Dewey, and Louie Duck, of course. Alvin, Theodore, and Simon Seville, and their Chipette counterparts, Brittany, Jeannette, and yes, Eleanor. The recent pandas in China. Chandler, Leslie, and Frank Jr. Jr. on “Friends.” But did you know that Babar had triplets?! Neither did we. In fact, I have yet to come across a person who DID remember that, despite the fact that we all read Babar as children. So how did we find out, you ask? Well, shortly after the trips’ six month birthday, their great-grandmother, Gee, presented them with this VERY special gift she found in London, featuring everybody’s favorite pachyderms! One, two, three cribs! Two blue and one pink! 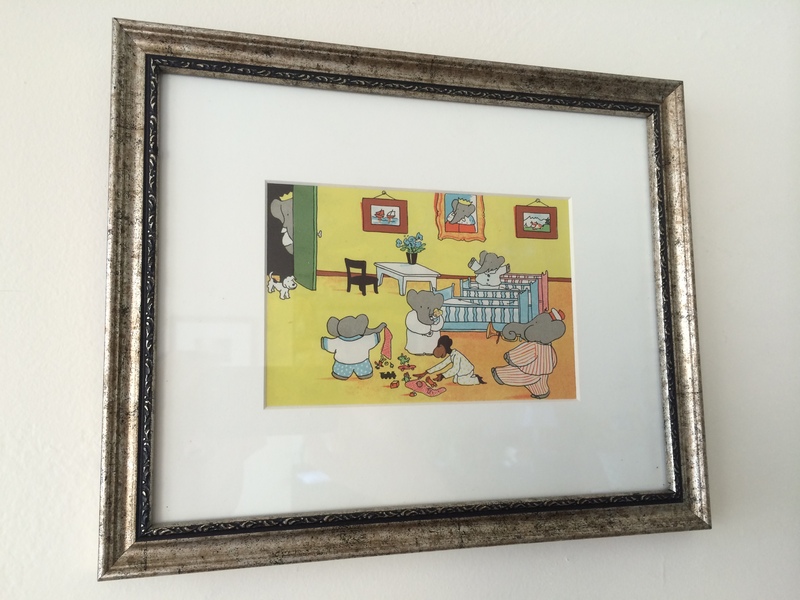 It is not widely known that Babar’s children are triplets, and in fact, a quick internet search of triplet characters does not reveal this trio anywhere. Still, if you can get your hands on a copy of Babar and his Children, you’ll find the birth story of their spontaneous triplet children, Pom, Alexander, and Flora. Babar and Celeste were surprised, to say the least! So how does this relate to Christmas? This long overdue mention of the very special print featuring Henry, Jack, and Sophie’s elephant counterparts? Well, as you’ll notice in the photos below, our trio received another special gift from Gee and Poppy this holiday: a 1940s lithograph print of Babar and Father Christmas, originally purchased by Henry, Jack, and Sophie’s great-great-grandmother and enjoyed by many generations of children over the last fifty years. What a special first Christmas in so many ways. It’s true that Henry, Jack, and Sophie aren’t likely to remember it, but I know the rest of us surely will. And each year, when the chaos of the Christmas season starts to feel overwhelming, I hope we’ll remember this Christmas. Our first Christmas as a family. Because when you look past the rest of it (the holiday cards that never get sent on time; the hours spent packing, traveling, and unpacking again; the scrambling to find the perfect presents for everyone on your list; the racing around from one holiday party to the next) it’s really about family. The Christmas cookies don’t hurt either. Family and Christmas cookies. That’s why they call it the most wonderful time of the year.